The BRICS nations still rely on the West to determine the likelihood of a new economic crisis, but some Russian economists want to change the status quo. Read Nikita Dulnev's opinion on the next page. Economists from Argentina, Brazil, and Russia have begun evaluating the possibility of creating their own risk assessment agency to analyze economic development in emerging economies, such as those that make up BRICS: Brazil, Russia, China, India, and South Africa. Over the course of several informal meetings representatives discussed the systematization of data and statistics collected by BRICS countries. The consortium is currently one of the biggest movers and shakers in the global economy. At the G-20 summit that was recently convened in Los Cabos, Mexico, BRICS representatives proposed a new strategy for global economic development in which member countries would lead changes aimed at restructuring the international financial system. This first step aims to take down the world jury, whose members have assigned the role of risk evaluator to themselves and collaborated (covertly or otherwise) with the world’s leading financial groups. Not surprisingly, they also receive the greatest benefit from these agencies’ rushing reports, which can make or break the economies of entire nations. Recently, we have witnessed several examples of this. Under the current economic world order – and more so with each passing day – traditional credit rating agencies have the authority to hand down subjective rulings that are taken at face value as absolute economic truths. Reports produced by these agencies are considered sacred, as was the case with opinions presented by some of the 20th century’s most infamous financial advisors on Wall Street and in London. The financial markets still retain scars from the predictions of Federal Reserve gurus, which directly led investment behavior, more so than reports from big banks or even the World Monetary Fund during the 1960s and 1970s. The opinions of current and former U.S. Federal Reserve chairmen – Paul Volker, Alan Greenspan, and now Ben Bernanke – continue to encourage volatility in speculative investments. However, they lost much of their clout following the 2007-2008 crisis and the ongoing 2010 recession. Currently, global finance decision-making and the futures of entire economies are most affected by information – however arbitrary – provided by the rating agencies. This data has led to massive panic attacks, worthy of a social psychology experiment involving national archetypes of liquid capital mobilization. At the most critical point in 2008, Lehman Brothers derivatives were devalued because of phenomenal securities speculations. As a result, the market was destabilized and panic surged among individual private investors. Three weeks later, the bottom fell out on Lehman Brothers’ stock, provoking a frenzied rush against one of the market’s major players. The outcome was the ridiculous offer put forward by J.P. Morgan at the very end of the debacle, which caused the financial system to implode in August-September 2008. The current crisis is characterized by the type of debacle induced every time Standard & Poor’s, Fitch group, or Moody’s compares one nation’s bond yields with that of some reference point in a particular sphere of influence. The comparison of bond yields in Greece, Spain, and Italy with those of Germany illustrates the importance and prominence of these analyses. Despite being based on liberal subjectivities, dogmatic interpretations, discriminatory parameters regarding consumption norms, protection policies or the financial contributions of particular regions, corporations or investors, these reports become the truth. In the specific cases of Russia and Argentina, the material conditions of key indicators used for evaluating risks in these economies is far superior to the type of analysis they are subjected to by the current evaluators. Russia is the 9th most important economy in the world, having recently been inducted into the World Trade Organization (WTO). After meeting all of the extreme requirements for membership in the WTO, Russia has been “classified” by the current rating agencies as unstable. This is because this assessment does not take into account that petroleum and gas are projected to continue rising over the middle- to-long-term. Russia’s GDP is growing – with indications that this expansion can be sustained over time – and the country possesses accumulated reserves far in excess of the nation’s debt. As a result, it is now crucial that emerging economies like BRICS create other risk assessment entities willing to apply more inclusive criteria based on the diverse economies that exist in the real world. These new agencies should aim to more positively influence the psychology of individual investors, by applying broad-based criteria rather than generating panic and compulsive behavior vis-à-vis highly volatile liquid assets. An international BRICS risk assessment agency, composed of representatives from all or some of the group’s member countries, could offer a unique opinion that is more firmly grounded in reality. The agency would strive to encourage productive investing and regulated risk, in order to avoid sudden changes in opinion in financial markets and resultant recessions and endless crises. This project is one of the topics scheduled for discussion at the upcoming BRICS summit in South Africa next March. Specialists from the group are working on two important financial proposals: the BRICS Bank, also known as the “South-South” Bank, and a money exchange headed by the BRICS alliance. These outstanding proposals for rectifying the current financial situation clearly require new means of interpreting the economy. The proposed BRICS risk assessment agency could be the one to apply these changes. Mario E. Burkún is an economist and vice-chancellor of graduate studies at the National University of La Matanza in Argentine. He also serves as a government advisor on international affairs. After the last economic crisis, the world suddenly came to wonder if the major global rating agencies – Standard and Poor’s, Moody’s and Fitch – were actually independent businesses. A resounding “no” has increasingly become the standard reply. However, claims have become commonplace that these agencies, which are both based in the United States, at least take the opinions of the American government into account. These corporations wield so much clout that releasing them into private hands would be as much folly as allowing nuclear warheads to become personal possessions. The agencies’ so-called “ratings actions” could have an effect comparable to that of weapons of mass destruction. Moreover, this effect would be both economic and political. For example, a sudden upgrade or downgrade of a large company could lead to the explosive growth or collapse of its stock price, causing shareholders to make or lose billions of dollars in a matter of minutes. It would seem very tempting to cut a deal with one of the agencies, in order to ensure than one’s family does not have to work for generations to come: For agency employees, the idea of getting in on such a deal could be just as tempting. If these rating agencies were totally independent in their decisions, then such cases would become a serious threat to global economic stability. Government control mitigates this problem, even if it does not resolve it entirely. Serious accusations were first leveled – primarily at S&P – in 2008, after the collapse of Lehman Brothers brought on one of the largest bankruptcies in U.S. history. It did look strange indeed. An entire financial empire was disintegrating, but kept the highest possible AAA rating right up to the official announcement of its bankruptcy. This was perhaps the most spectacular blunder committed by the global rating agencies. Questions were subsequently raised as to why the United States kept its AAA rating, even though it had the world’s largest public debt; or why the ratings of Greece, Portugal, and Spain were only downgraded after they asked for assistance, and so on. Russia’s BBB rating is also controversial, as some experts consider it to be unreasonably low. If it is assumed that all of these accusations are not totally baseless, it would follow that the agency’s position contradicts the “logic of numbers” associated with key economic indicators. Furthermore, it could then be said that the rating agency follows a logic that could be called government-inspired. What if S&P had downgraded Lehman Brothers two or three months earlier, before it was actually declared bankrupt? The $62 trillion credit default swap market would then have collapsed exactly two or three months earlier, as well. That was the beginning of the global financial crisis. Before this, the crisis was local and limited to America. S&P’s procrastination afforded the U.S. government extra months to prepare for the crash of the financial system. Had the agency reacted to the processes inside Lehman Brothers sooner, the crisis would have been far more painful. That would have been a problem mainly for the United States. The matter of the U.S. credit rating, on the other hand, is actually of global importance. Assume for a moment that, terrified by the number of zeroes in America’s debt figure, S&P had decided to cut the country’s rating by at least one grade. The agency would have had to announce for the whole world to hear that the U.S. was no longer a stronghold of stability and that this unsinkable economy was coming under threat. Consequences of such a reckless step would have thrown the world’s development back by decades. The U.S. debt is held primarily in denominations of U.S. Treasuries (UST), which have maturities of 20–30 years. Americans will not have to repay this debt any time soon. Bond prices would fall considerably if America’s rating was cut; this would benefit the U.S., which would have to pay its creditors less. The creditors, the biggest of which is China, would then get short-changed. According to official statistics, China holds $900 billion worth of U.S. Treasuries (which is 30 percent of USTs worldwide). Americans within the U.S.-China Economic and Security Review Commission have even claimed that this number has been understated. China would need more than ten years to get rid of those bonds painlessly – if dumped all at once, they would instantly become worthless. This means that China is, first and foremost, interested in the stability of both the U.S. credit rating and the U.S dollar. Other large UST holders include Western European countries and oil-rich Arab states. A U.S. rating downgrade would hurt the world’s leading economies. Taking these considerations into account, S&P’s reluctance to cut America’s rating is logical and makes perfect sense. Moreover, the agency is actually maintaining a more than correct rating. Leading global players are not interested in an American sovereign default, since they are American Treasury holders. This means that, in case of a deep dollar crisis, the entire world would be prepared to rush to its rescue out of sheer self-interest. There is a reasonable logical behind Russia’s understated rating as well. The problem, however, is that it is only reasonable from the point of view of the economic interests of the United States and Western Europe. If Russia’s rating was upgraded tomorrow, amid global financial instability, then Russia would become an island of stability in a sea of economic crisis. This would signal to investors that they should keep their money in Russia, because it would only be safe there. Despite all the controversy of such a statement, one thing is certain: Europe and the U.S. are not interested in such a development. This is because it would mean capital flight from their economies into Russia’s. The rating agencies are, therefore, actually defending the economic interests of the U.S. This is even understandable, because America is the key market for both agencies. 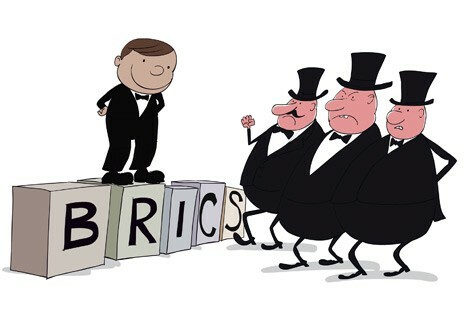 The fact that the “big three” rating agencies will inevitably be standing guard over the American economy has generated the idea of creating a similar agency for the economies of BRICS countries. This outlook has been far from rosy, however. The American agencies owe their influence to their reputation and history. They are trusted, despite their occasional mistakes. For instance, S&P has been in business for more than 150 years, 50 of which it has served as a key bellwether for investors worldwide. These companies also possess databases that they have been developing for decades for ratings assignments and forecasting. Emerging markets simply cannot yet compete with these two advantages. It is also not quite clear what a “BRICS rating agency” would practically mean. BRICS is an informal grouping of the largest, fast-growing economies in the world, and integration amongst those five countries is out of the question at the moment. In any case, such a newfound agency would have to belong to one of those countries, and it would defend its interests before the interests of the others – this fact alone would prevent investors from treating such an entity seriously. As a result, a BRICS rating agency would have no real clout, at least until it proved its worth. And this could take decades. Nikita Dulnev is RBTH Economic Observer.